and supply of handmade traditional timber windows. 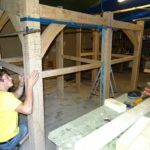 With a background in high class Carpentry, Joinery and Cabinet making, you can be sure that my work is done to the highest standards. Door fitting is a job I have always loved doing. 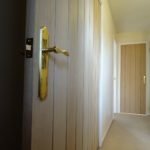 Cutting a door to size and shape isn’t always as easy as it seems, with original frames or linings that can sometimes be out of level, or are not quite square or straight. It always provides me satisfaction knowing I can work as an artisan to fit your doors to a very high standard. Wood Laminate floors are brilliant. 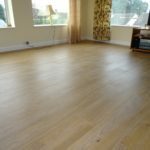 With my skill set, They hastily provide a good looking, finished floor on a budget. Working on around two days for an average floor with skirting and architrave also replaced! 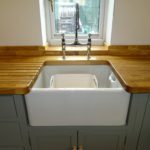 Belfast sink unit, this kitchen was built to last, with fully dovetailed units, solid oak worktops, mortise and tenon jointed framing and doors. The finished job was a high quality farmhouse kitchen. 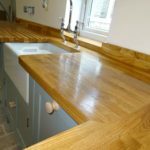 The beautiful solid oak worktops after all the hard work of cutting and joining them. Me and my customer were very pleased with the result. This green oak frame had over 50 mortise and tenon joints when finished, this was a final test fit before it was all dismantled and put up at my customers home. A project I planned with my customer, then crafted from start to finish. Working with large sections of tree I crafted a beautiful hand tooled traditionally jointed green oak frame. 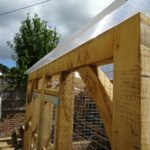 The frame was designed as a run for rescue rabbits, but could equally of been used as a dog kennel or a summer house. I take a huge amount of pride in the work I do and always finish the job with a happy customer, so if you need a job done that matches my products or services please enquire to get a quote. Please remember if its made from wood its crafted with pride by .